Hot on the heels of the launch of the new Apple iPhone 4 with iOS 4, CompanionLink announces full support for synchronization with the iPhone 4. CompanionLink allows you to sync contacts, calendar, tasks and notes with the iPhone 4 from PC software such as Microsoft Outlook, Lotus Notes, ACT! by Sage, Palm Desktop, GoldMine, GroupWise and more. CompanionLink is also compatible with previous-generation iPhones running the new iOS 4. Two-way sync is fully supported with the native contacts and calendar apps on iPhone 4, allowing users to create and edit data from their iPhone 4 and sync back to their PC. Advanced contact management functionality for iPhone 4 is available through DejaOffice, suite of contacts, calendar, tasks and notes apps for iPhone 4. DejaOffice is our robust suite of calendar, contacts, tasks and notes apps for Android. We’ve been hard at work adding a multitude of features that you can leverage to increase productivity and complement your workflow. To better showcase these features and how they can be used, we’re proud to introduce the new DejaOffice Classroom. DejaOffice is available from the Android Market at no cost, and is compatible with the HTC EVO, Motorola Droid, HTC Droid Incredible and other Android phones. Will all the cool new Android phones recently released like the Droid Incredible and the EVO 4G, AT&T subscribers looking for an Android have reason to feel a little bit left out in the cold, as their only current choice on AT&T is the Motorola Backflip. On June 20th, AT&T subscribers will have another choice – the HTC Aria. The HTC Aria is a slick little device that features a 3.2-inch display, a 600MHz Qualcomm processor, and Android 2.1 with the HTC Sense user interface. It manages to pack in all these features while keeping the size and weight down to minimal levels. It looks like it will be a great device for professionals focused on mobility. DejaOffice, an application suite of contacts, calendar, tasks and notes apps for Android, now allows you to link your contacts to individual calendar entries, tasks and notes. This lets you easily check who an appointment or a meeting was scheduled with, or view everyone attached to a certain project in your task list. To link a calendar entry to a contact, open DejaOffice, navigate to the calendar, and bring up the details screen for a calendar event. From here, tap the ‘Add Contact’ button and your address book should open up. Select the contact you’d like to attach, save, and you’re done! The brand new HTC EVO 4G, out June 4 on Sprint, is quite the landmark phone. It boasts a huge screen, top of the line specifications that make Android fly, and the first 4G data connection for high-speed internet access. Early reviews have been overwhelmingly positive, and it looks like the HTC EVO 4G will set the bar for the next generation of mobile devices. We here at CompanionLink can’t wait to get our hands on one tomorrow and see DejaOffice, our new Android app, running on that gorgeous screen. DejaOffice is a suite of super-charged calendar, contacts, tasks and notes apps for the EVO 4G. It has advanced features that provide more flexibility and functionality than the native apps, such as category colors, variable font sizes and more search and sort fields. DejaOffice is available from the Android Market at no charge, just search the Market for “DejaOffice” on your EVO 4G. 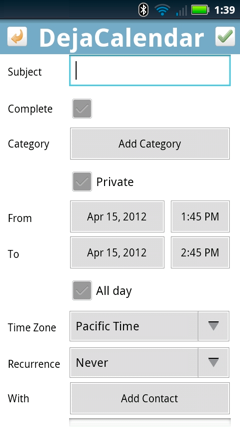 DejaOffice works with CompanionLink to sync data from your PC. 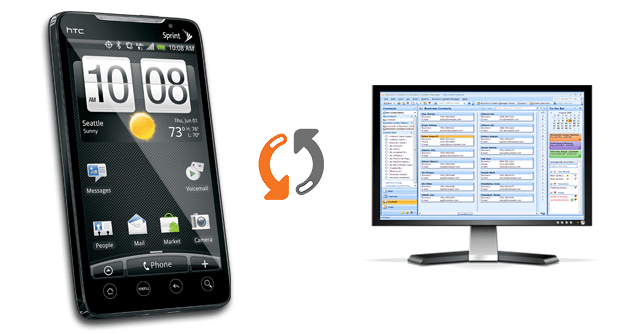 CompanionLink can sync the EVO 4G with Outlook, Lotus Notes, ACT! by Sage, Palm Desktop and more. 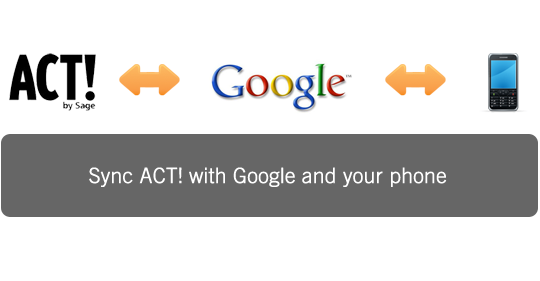 Sync either direct via USB or wireless through Google. Download a 14-day free trial here.